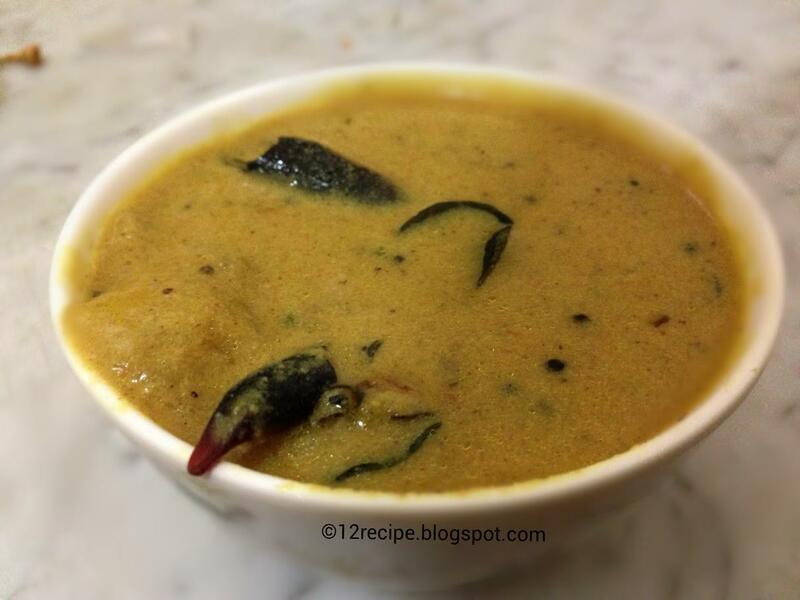 Raw mango curry is a rich curry flavored with tangy raw mangoes. This is a simple, quick and tasty curry that goes well with steamed hot rice. Dry roast the coconut grated until crisp and starts to change its color. Add turmeric powder, chilly powder and coriander powder in a low flame after mixing well in each addition. Roast for a minute and switch off the flame. After cools down completely, grind in to a smooth paste by adding little water. Heat oin in a pan, splutter mustard seeds. Add hing and coconut paste along with a cup of water. Allow it to boil for 4-5minutes. Add chopped mango pieces and salt in to it. Cook for another 5 minutes until curry thickens and mango pieces get cooked.